Custom physic vehicle simulation! Project download included. Also, feel free to download the project file and have some fun with it! If you would like to contribute to this free project, please contact me. I need help making all of this work in multiplayer but any visual improvement is welcome too! Forgot to say that the car 3D model come from the internet, I have no idea if it can be used in commercials projects so it would be safe to assume it is not. Discord server to discuss the project in real-time with me and everyone else! Last edited by JX53mb; 03-24-2019, 04:40 PM. Awesome man. I tried something like this a while back but was never satisfied with how the vehicle felt. It was incredibly bouncy, but yours doesn't seem to suffer from the same problems. I appreciate you uploading the project. How customizable is it? From the vid, the car looks to be FWD, can I make it RWD? 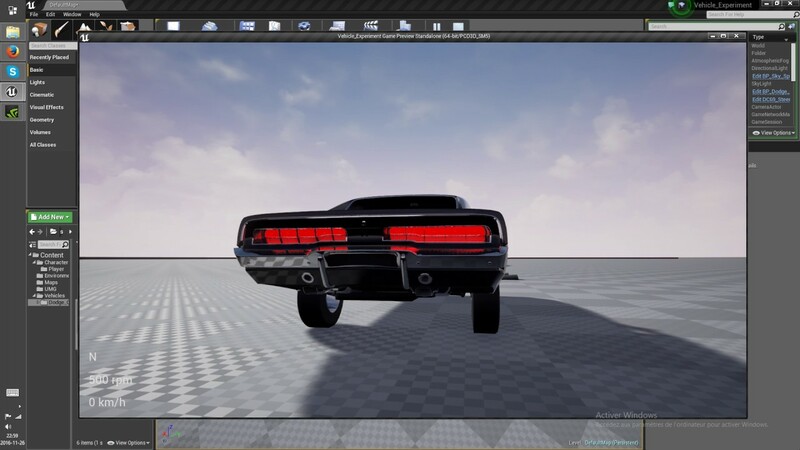 Also, do I need to remake the car mesh (skeletal mesh) I made for the default system or will it work? Does it work at low FPS (10-15)? 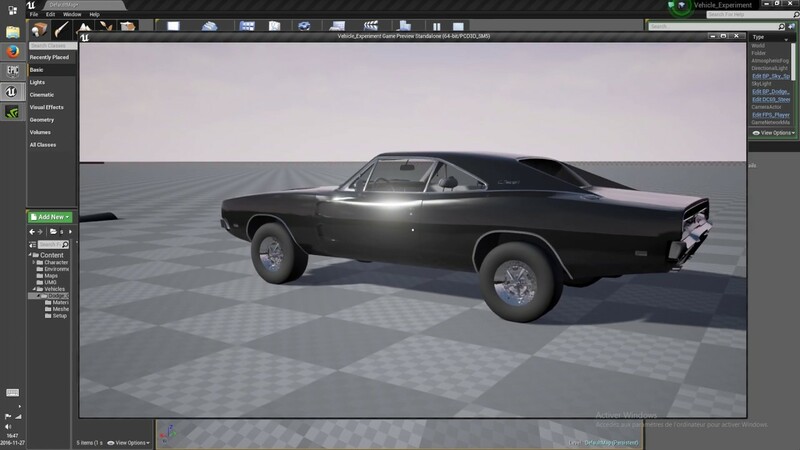 the vehicle in the video is a rear wheel drive, you can see it from the burnout while facing the wall, but you can apply torque to anny of the wheels you want, even apply torque to the left wheels only if you want to xD it is very customizable, and the vehicle body does not have to be a skeletal mesh at all, it can be, but does not HAVE to. I just made a collision mesh inside 3ds max, using the UCX thing. Any mesh you use with the default wheeled vehicle class should work with this class too. as for the fps, I dont know, I run the project at 210 fps. if I lower it to 60 fps by activating the V-sync, I do not see any difference in the physic simulation at all. Plus you can always activate physic substepping wich is turned off right now as it is not needed. Where you able to open the project without problems? Yeah it opened fine, it runs at 120 FPS, my max FPS the Editor will allow, which is normal for the titan x on my work computer and my GPU at home is a 1080 so I can't really test it's performance. The only thing that doesn't run good on these cards is Forza Horizon 3. 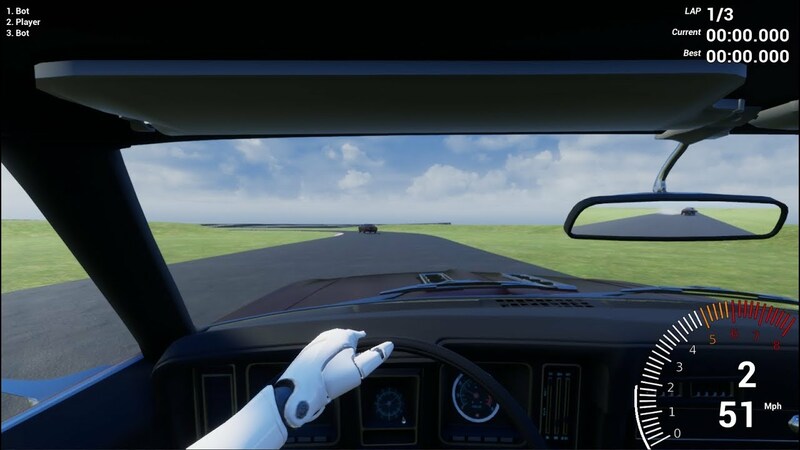 I'll keep messing with it, I moved the camera over to be centered on the vehicle as the offset felt a little weird, and added controller support to it. I need to test the reaction whenever 2 wheels overlap next. The manual switching requires 2 clicks for a gear change? 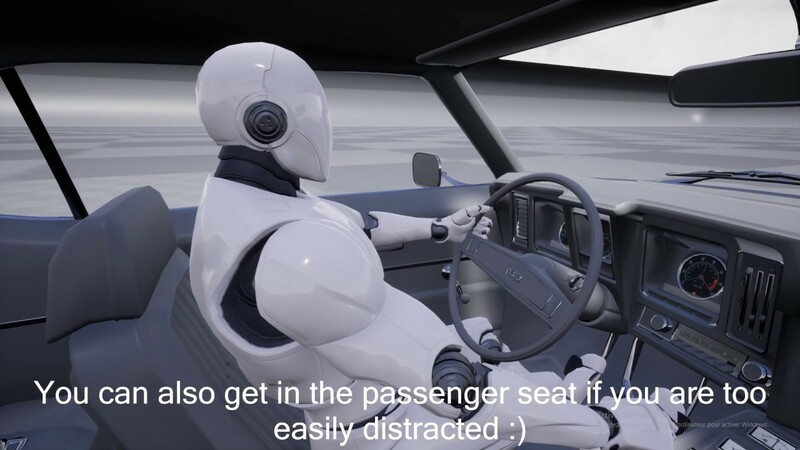 you should switch it to AWSD control and space for the brakes. The manual switching requires 2 clicks for a gear change? Well, one to shift up and one to shift down, I want to make an automatic transmision later tho. you should switch it to AWSD control and space for the brakes. You can change the controls to wathever you like I am personally going to map them to a controller. A bit tricky to get used to the manual gearbox, but overall the behavior is great. Wanted to ask about customization settings such as acceleration, top speed, steering curve, etc. but found them already - all neatly grouped in the "Setup" category in the variables. Q: What is "Fake Wheels Min Ang Vel"? As for bugs/troubles/crashes - none so far. Well you know what the fake wheels does, right? The "Fake Wheels Min Ang Vel" Is how much angular velocity the fake wheels can have under zero. For when the car is going fast on reverse if you set this to zero, you will notice that the wheels won't seem to spin anymore while driving backward. Last edited by JX53mb; 11-27-2016, 12:12 AM. little bit of improvement, better control of the car, steering wheel actually steering, glass material, some lights, and few clean-ups of the blueprints. If you want to contribute to this project just message me and of course, please let me know what you think of this project and how I could further improve it. Would love sample setups for front and all wheel drive. I tried setting up 4-wheel drive, but the steering got pretty sensitive. "what the fake wheels does" - could you elaborate on this? Also quite a bit of clean-up in the blueprint again to make it easier, like tooltips for the variable and such. Download in the first post version 1.2.